I would like to develop LuaLatex packages. I am very interested by the scripting capability of LuaLatex, so I'd like to use it as much as possible instead of Latex or Tex. Is there a "standard" or "time-tested" way to write a LuaLatex packages? What is the main differences/similarities between Latex packaging and LuaLatex packaging? luatex is a two-language system and a lualatex package can use either language. You could write a package written just as a classic latex package but using some of the extended tex commands available in luatex, such as \umathchar etc. In one case, The coding practices are just as in classic TeX, in the other case, the coding practices are those of Lua (mostly). Not the answer you're looking for? 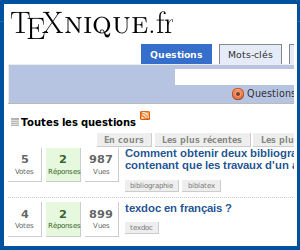 Browse other questions tagged luatex package-writing or ask your own question.